So just let’s start to copy DVD to Exteral Hard Drive For Streaming on TV/Laptop/PC/PS4/PS3, ETC. A DVD Ripping Tool – You can rip unprotected DVDs with Handbrake but for commercial DVDs, you have to turn to a professional DVD ripping tool to remove the copy protection. If you don’t mind all the DVD rips are MKV files, you can use MakeMKV. But I prefer Pavtube ByteCopy for its DVD (and Blu-ray) decryption power. It supports to decrypt AACS, BD+ up to v61 while MakeMKV only supports up to v60. And ByteCopy can 1:1 backup DVD movies, main title copy DVDs and convert DVD to lossless MKV, Multi-track MP4/AVI/MOV, SD/HD MKV, MP4, WMV, AVI, 3GP, 3D SBS MKV/MP4, H.265 MKV/MP4, 4K MP4, etc. For more functions, you can refer to its review. DVD discs – It depends on what DVD ripping software you choose. If you choose Handbrake, your DVDs should be unprotected. If you are using ByteCopy, you can copy any DVD to External Hard Drive like the new released House Of Cards, Hannibal, The Walk, Spectre 007, The Martian, Game of Thrones Complete Seasons (1-6), etc. A Computer – Note: If you are using a Mac, you shoulf use Pavtube ByteCopy for Mac. Step 1: Run DVD ripping tool and insert your DVD to internal/external drive and click “File” to load the DVD discs to copy DVD to External Hard Drive. DVD discs, DVD folders, DVD IFO/ISO are all supported. 1.You can add more than one DVD movies at a time for its batch conversion function. Step 2: Now you should choose a way to copy DVD to External Hard Drive. You can keep all the information in DVD movies, including main title, advertisement, chapter markers, review and the whole audio/subtitle streams. Just the main title of the original DVD disc will be preserved in this way. It will save many space on your hard drive. Transforming DVD to MP4, MKV, MOV, AVI, etc popular format gives you wide playback on different devices such as Samsung TV, LG TV, PS4, PS3, Xbox One, Tablet, Laptop, etc via Exteral Hard Drive. Click “Format”, you can choose the desired format in “Common Video” or “HD Video” profiles. On the other hand, you can choose the optimized preset for mainstreaming multimedia players, like PS3/PS4, TV, HD Media Player, etc. 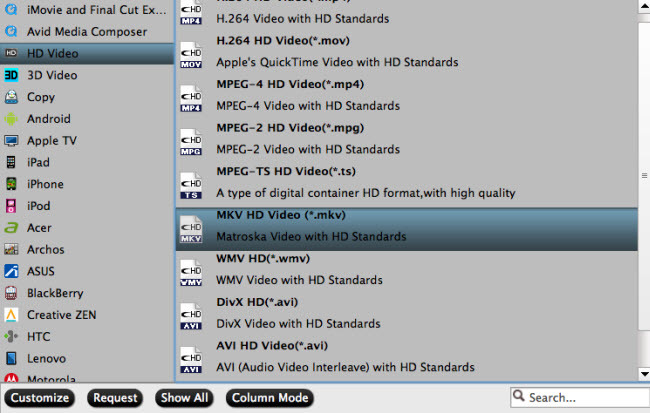 If your devices support MKV format, you also can choose lossless MKV format. Note: In the third way, you can adjust the video/audio parameters in “Settings” to determine the output video size. 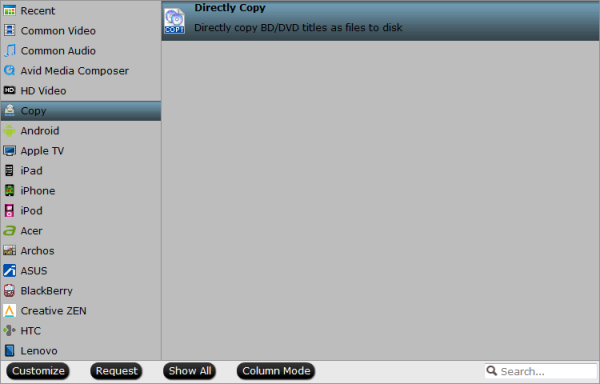 Step 3: If you chose the latter two ways, click big red “Convert” on the UI to begin copying DVD to External Hard Drive. Locate the generated video in output folder. Copying DVD to LaCie Fuel allows people to stream DVD movies with a Mac or PC However, it also has built-in wifi too, which will allow you to transfer files to or from an iPhone or iPad when you need to. Saving DVD movies to iPocket Drive also can make you playing your DVD movies on Mac and PC. But it also can enable you to play movies on iOS devices. It’s compatible with the iPhone 5/5s/5c/6/6 Plus, the iPod Touch (fifth generation), the iPad 3/4/Air/Air 2 and the iPad mini 2/3. There are some other best external desktop and portable hard disk drives that can save your DVD backups. Of course, there must be other excellent External Hard Drive to store your DVD rips. When you copied DVD to External Hard Drive, you can stream your DVD movies on TV/Laptop/PC freely. Apart from External Hard Drive, saving DVD to NAS is another great way to store and play your DVD movies. How to Play DVD on LG BD670 Without Changing Region codes?